We all have our favorite potato salad, but it's fun to try something a little different. If you just want to spice up your regular recipe a little, try adding different chopped vegetables or top it with sliced onion rings and tomatoes. Or serve your favorite potato salad on a bed of crisp lettuce and sliced tomatoes. Some vegetables that are especially tasty in potato salad are sliced or chopped cucumber (preferably seeded), tomatoes, celery, chopped onion, sliced green onion, sweet red, yellow, orange, or green bell pepper, and English peas. 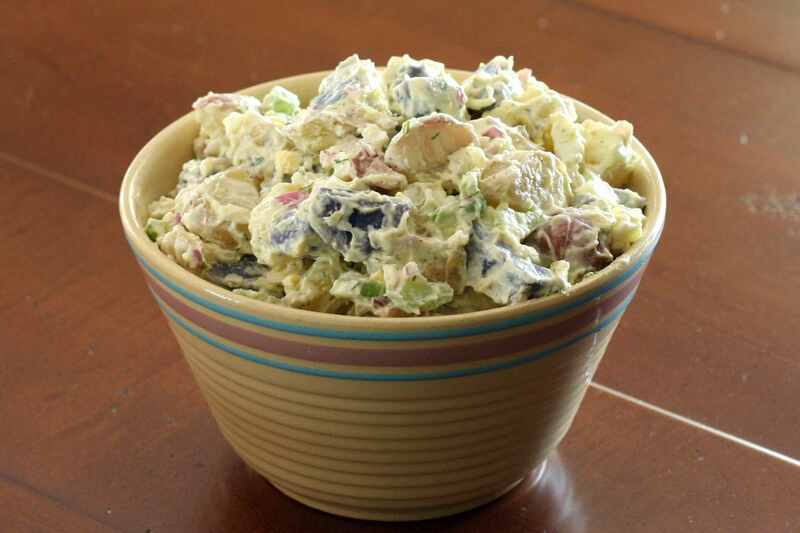 This potato salad is the perfect choice for a Fourth of July cookout or picnic. Purple potatoes, unpeeled red-skinned potatoes, and white potatoes make up the delicious themed salad. This version includes eggs and a combination of mayonnaise and sour cream, but feel free to alter it a bit if you have a favorite dressing. Baked potatoes lend their unique flavor to this potato salad. Bacon, cheddar cheese, green onions, and a flavorful sour cream and mayonnaise dressing brings the salad together perfectly. Fingerling potatoes, with their buttery flavor and firm texture, are an excellent choice for potato salad. The salad might be an easy preparation, but it doesn't lack flavor. Hard-boiled eggs are added to the salad along with red onion, cucumber, and celery. This red potato salad includes bacon, onion, and celery. Chopped dill pickle adds to the flavor of the salad along with a tasty mayonnaise and vinegar dressing. Steamed peas add refreshing flavor to this tasty potato and egg salad. This dish is a nice salad for a spring or early summer meal. It's a good luncheon salad as well. Some prepared mustard adds tanginess to the dressing. This is a family favorite potato salad with eggs, mayonnaise and mustard dressing, and some optional chopped celery and onion. The dish will be your go-to recipe for potato salad. Add this well-seasoned potato salad to your cookout menu. Besides potatoes, the salad contains some chopped cucumber, celery, a small amount of onion, and a tangy mayonnaise dressing with a touch of mustard. It's an excellent potluck salad. If you're making a potato salad for a group of people and you aren't familiar with their likes and dislikes, this is a good choice. The tangy oil and vinegar dressing includes garlic and simple seasonings. Fresh chopped parsley provides a splash of vibrant color. Bright purple potatoes take center stage in this attractive potato salad. Fresh cilantro adds flavor to the salad along with a combination of mayonnaise and lime juice. A variety of vegetables marry well with the potatoes in this potato salad. The vegetables include carrots, peas, red and green bell pepper, and celery. The creamy mayonnaise dressing is flavored with Dijon mustard and dill. This potato salad preparation offers a unique twist: roasted potatoes. 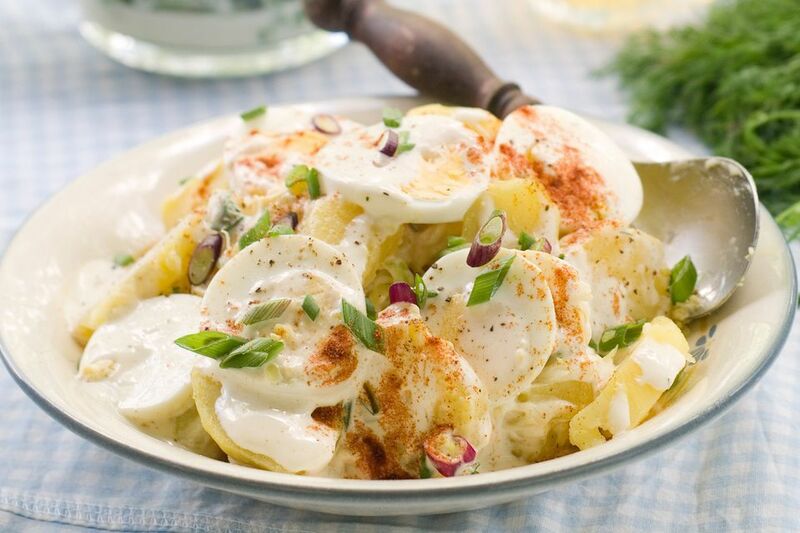 The well-seasoned roasted potatoes and onions are tossed with a lemony mayonnaise and sour cream dressing. Bacon drippings add flavor to the sweet and tangy dressing for this delicious German-style potato salad. The salad is served warm. This potato salad combines two great flavors: bacon and deviled eggs. The egg yolks from the hard-cooked eggs are mashed and mixed into the dressing. The secret ingredient in the dressing is some Miracle Whip salad dressing. It's mixed with mayonnaise and mustard, giving the salad a slightly sweet flavor. This delicious potato salad is kicked up with quick-pickled jalapeno peppers. The amazing mayonnaise salad dressing gets spicy flavor from some of the pickling juice, mustard, chili powder, and a dash of cayenne pepper. For those who don't like mayo, this potato salad has a dressing of olive oil, Dijon mustard, and some white wine. In this salad, Yukon Gold potatoes team up with yellow onions, roasted red peppers, garlic, and a lightly sweetened vinegar and oil dressing. This salad contains golden brown roasted fingerling potatoes and onions, along with some crumbled bacon and chives. The dressing is an oil and vinegar mixture with honey. This attractive potato salad includes carrots, green peas, and chopped dill pickles. Hard-boiled eggs are added to the salad as well, and it's dressed with mayonnaise.